Enter machine technology, becoming accepted as the norm in construction, able to help companies reduce costs, work more efficiently, create safer work environments and stay competitive. Some construction companies have been slow to adopt the technologies needed to transform their business according to the KPMG's 2017 Global Construction Survey. They report that despite 95 percent of global leaders in construction recognizing technology will significantly change their business, a mere five percent view their organizations as cutting edge when it comes to technology. I've supported construction companies of all sizes as they work through the question of technology and the potential impact it can have on their business. Most find the initial investment to be the biggest barrier. Everyone is under increasing budget pressure and markets are competitive. Construction companies are overwhelmed, not knowing where to begin, not to mention the impact on the workforce and the training required to do things differently. It's no wonder the industry is reluctant to change. Telematics on equipment ensures that machines are running efficiently as it provides real-time intel. The data produced by hardware attached to the machine can alert equipment managers of fault codes and many other aspects of operation including hours, fuel consumption, speed and engine temperature. The result is reduced maintenance, a better understanding of performance and overall reduced inefficiencies. The companies embracing technology are seeing the benefits, winning jobs due to more precise quotes based on greater accuracy in measuring time, materials and labour. As machines become more intelligent the industry will become more efficient. Jobs will change and work sites will evolve. Digging can now be done semi-autonomously using data with exact measurements, uploaded into the machine. It all starts with technology on the machines. Machine control offers the most immediate benefits to earthmoving applications – better fuel efficiency, lower operating costs, geolocation and data collection. It uses satellite data to pinpoint locations and assess grade, providing greater efficiencies, safety measures and an almost immediate ROI. A machine control system on an excavator, for example, can allow the operator to dig with confidence, without worrying about over- or under-excavating. Site surveying is another great example of how technology saves time and improves accuracy. Traditionally, surveying involves manually putting stakes in the ground and measuring from there. Recognizing that a lot can happen on the site which can cause errors in measurements, re-works are common and time spent fixing mistakes can be costly. Using machine control to survey sites reduces costs but can also provide accurate measurements the first time, a crucial component to estimating or providing data on a completed project. Take this one step further with drone technology. Instead of two days to survey a site, it takes 20 minutes with a drone. You can now fly a drone over the area to ensure banks and grades are in compliance and get accurate details of the jobsite while keeping workers safe. We also see a direct impact of machine control in grading applications. When building a road, using the correct amount of clay, asphalt and gravel is critical as estimating errors can be costly. New grading technology uses surveyors to determine how much dirt to cut or fill, the data is then transferred to the device in the cab of the machine, which informs the operator of the precision of the task ahead of them. Operators can get to grade faster, knowing exactly how much earth to remove or put back. GPS is used to operate the equipment to get the most accurate digging and grading outcomes. This means a re-work of sites is almost totally eliminated. Operators with decades of experience can improve their accuracy immediately and those with less experience require less training and deliver better productivity. 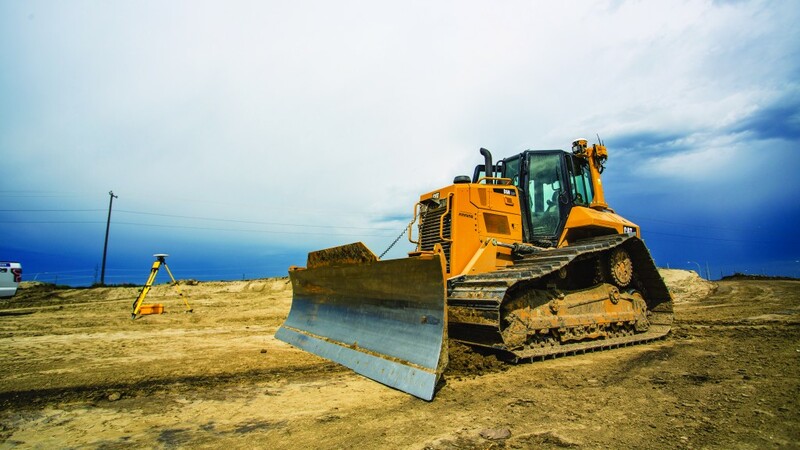 One of our customers, Calgary-based Kon Construction, has been in the earthmoving, site-grading business for over 50 years. During the economic downturn, Kon couldn't afford to buy new equipment. They identified their needs based on the workload for the coming year, checking hours they put on various machines to gauge usage. When a used, low-hour D6K machine became available through Finning, complete with the latest 3D GPS, they didn't waste a minute getting on board. They were the first in Western Canada to have this technology on a dozer. They knew they had fallen behind on the technology side and had to get into a new way of moving dirt; the GPS allowed them to easily check surveyor data and do their own quantity checks. Craig Sukon, vice president and general manager at Kon Construction commented, "It gives us the confidence in hitting our grade, that we won't over-fill or under-cut, that's big in our business. The accuracy allows us to move dirt once, instead of making a mistake and moving dirt twice, which cuts into our profits." There is a lot of talk about the future of autonomous machines and what it will mean to the industry. We're already seeing the benefits in earthmoving and excavation with semi-autonomous machines taking over a portion of the controls for the operator. From pipelines to trenches, basements and underground utilities, anyone can step into a semi-autonomous machine with little training and operate it safely and efficiently. Automation has resulted in projects being built more safely, faster, more efficiently, at lower cost and with less risk. It makes the best operators even better and the new operators better and faster. Augmented reality (AR) is another key technological advancement that is sweeping the industry. With the help of AR – site managers can get a real-world view of their project, capturing a picture of the jobsite and superimposing a 3D model of the design. AR can provide a huge competitive advantage when bidding as it provides potential clients with a real-life, accurate, detailed view of their project. This is not only beneficial for large-scale construction companies but now that the technology has become simplified and more accessible, smaller companies can also take advantage of it. Earthmoving and excavation can be a dangerous profession. We know fatigue is the number one danger on a jobsite. Technologies like wearable devices can be used to monitor sleep patterns and ensure operators are alert and focused. Machines can also be equipped with object detection technology, notifying operators of blind spots and potential risks, and sending alarms to workers on the ground when they are in danger. Technology not only makes the job safer for operators but also helps to reduce the cost of entry for training. I see this as a huge advantage for customers. With the right technologies, such as machine control and semi-autonomous equipment, training is minimal and return on investment is fast. Many fear the move toward autonomous construction equipment will put people out of work. This is not the case – jobs are not ending, they are evolving. Skilled operators will still be in high demand and needed to supervise projects and monitor sites, intervening if necessary. Instead of sitting inside the cab, they will be operating machines remotely from a safe distance away. Not recognizing technology as an investment, but rather as a cost, remains one of the biggest challenges in the industry. It can take years to plan a new project and even longer to build; technologies can change quickly and, in the past, businesses have been afraid of their investment becoming obsolete. The construction workforce is also changing. Operators are aging and with that comes the risk of a skilled labour shortage. However, the adoption of innovative technologies will undoubtedly help in attracting a younger demographic of data scientists, tech-savvy operators and site managers who see new opportunities in the earthmoving and excavation construction industry. Trevor Tetzlaff is manager of SITECH Technologies for Finning Canada. He has 12 years of industry experience providing e-business and product support marketing for Finning and for the last five years he has been leading the technology strategy development and execution for the company focused on providing construction technology solutions.